Oxidized pitches with different oxygen content were prepared using ethylene tar as a raw material by air-blowing method, then the resultant pitch-based activated carbon fibers (ACFs) were prepared through spinning, stabilization, carbonization, and CO2 activation processes. The results showed that the oxygen content of prepared oxidized pitch was up to 4.44% when the basic pitch was air-blown at 250 °C, and the BET surface area of the corresponding ACF was up to 1047 m2/g with 0.536 mmol/g carboxylic group, 0.043 mmol/g lactonic group and 0.193 mmol/g phenolic hydroxyl group on the surface after 900 °C CO2 activation. 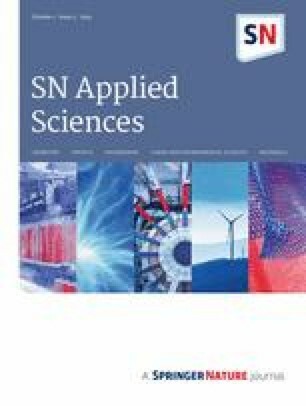 It revealed that the spinnability of oxidized pitch became poor as increasing its oxygen content, while the obtained carbon fiber was easy to be activated and the prepared ACF was equipped with large specific surface area and rich surface functional groups. However, the pore structure was easy to collapse and the surface area was seriously decreased when the oxygen content of pitch precursor was too high. Therefore, the property regulation of pitch precursor could effectively improve the porous texture and surface chemistry of the resultant ACF. Porous carbon materials have great advantages in environmental governance due to their characteristics of hydrophobicity, high chemical stability and thermal stability, large surface area and abundant pore structure [1, 2, 3]. Among them, activated carbon fiber (ACF) is attracting more and more attention as a novel porous carbonaceous material with excellent properties. Compared with commercial activated carbon (AC), ACF has the advantages of larger adsorption capacity, faster intramolecular adsorption kinetics and flexible engineering application [4, 5, 6], which make it widely used in the fields of hydrogen storage , air purification  and waste water treatment , and so on. However, higher production cost than AC limits the application of ACF. Therefore, it is particularly important to further improve the adsorption capacity of ACF on the premise of reducing cost. The pore structure and surface chemical composition of ACF have great influence on its adsorption capacities, so it is of great significance to explore the regulation mechanism of ACF pore structure and surface chemical composition to improve its adsorption capacity. At present, the regulation of ACF pore structure and surface chemistry is mainly focused on the improvement of activation methods and conditions. They compared chemical activation with physical activation , and proposed new activation methods such as direct activation , catalytic activation  and microwave activation , but these methods could only prepare ACF with specific structure, while the regulation mechanism of ACF pore structure and surface chemistry could not be systematically understood without studying the carbonaceous precursor. However, the properties of carbonaceous precursor have a significant effects on the development of pore structure and surface chemistry of ACF , and to some extent determine the properties of resultant ACF. Hence, recently the research of carbonaceous precursor catches extensive attention. Derbyshire et al. prepared isotropic pitches from four different raw materials (coal-tar pitch, coal extracts solutions, shale oil and petroleum) to serve as the precursors to compare the formation and properties of ACF from different precursors. Vilaplana-Ortego et al. used coal tar pitch and petroleum pitch as the precursors to explore the influence of different precursors on the pore structure of resultant ACF. Tekinalp et al. studied the effects of molecular composition and structure of a given isotropic pitch precursor on the pore size distribution and adsorption behavior of ACF. Moreover, oxygen presented in the precursors also has a significant impact on the properties of ACF. Proper oxidation treatment can make the aromatic molecules in pitch precursor polymerized into non-planar macromolecules, and the aromatic compounds in pitch can be selectively oxidized into oxygen functional groups such as benzene polycarboxylic acids [18, 19]. The subsequent carbonization and activation process may be impacted to improve the pore structure and surface chemical properties of the resultant ACF, thus promising to prepare ACF with better adsorption performance. Therefore, in this work we attempted to regulate the pore structure and surface chemistry of ACF by changing the oxygen content of pitch precursors. Ethylene tar (ET) was used as a raw material to prepare the pitch precursors considering that ET is a byproduct from naphtha cracking process with low cost and a large scale production, which is a complex compound consisting of almost 1–2 cyclic compounds . Air-blowing is the most widely used method to regulate the properties of pitch due to its low cost and simple operation [21, 22], so we adjusted the oxygen content of the pitch precursors by the air-blowing method under different oxidation temperatures. As to activation method, physical activation with CO2 or H2O is the usual procedure to obtain ACFs. Although the cost of H2O activation is low, the gas flow of H2O steam is difficult to control. With CO2 activation, the temperature of the activation reaction is easier to control, so CO2 activation is more conducive to investigate the regulation of the properties of prepared ACFs. Therefore, the pore structure and surface chemistry of resultant ACFs prepared from pitch precursors with different oxygen contents under CO2 activation were compared. The ET (Wuhan Luhua Yueda Chemical Co. LTD, China) was used as a raw material for preparing spinnable pitch, which is completely soluble in toluene. The oxidized pitch precursors were prepared by the air-blowing method as follows: Firstly, the ET was distilled at 250 °C for 3 h in the 3 L/min N2 mood to remove the light components to obtain basic pitch. Then, the basic pitch was air-blown at different oxidation temperature (200, 250, 300 °C) for 3 h in the 3 L/min air mood to attain oxidized pitches. Finally, the oxidized pitches were further heat treated at 320 °C for 3 h in the 3 L/min N2 mood in order to obtain the spinnable pitches with high softening point (SP) of approximately 200 °C. The resultant ET-derived oxidized pitch precursors were labeled as ETP-200, ETP-250, ETP-300, respectively. For comparison, the ET was directly distilled at 320 °C for 5 h in the 3 L/min N2 mood to prepare the ET-derived spinnable pitch (ETP). The prepared ETP, ETP-200, ETP-250, ETP-300 were spun into pitch fibers using a melt spinning method with a single-hole spinneret (diameter = 0.2 mm, length/diameter = 3) at the spinning temperature of their SP + 50 °C. Then the obtained pitch fibers were stabilized from room temperature to 250 °C for 1 h with an air flow of 200 mL/min, the stabilized fibers were successively carbonized at 800 °C for 1 h with a nitrogen flow rate of 100 mL/min in corundum tube furnace. Lastly, the carbonized fibers (CFs) were activated under a CO2 flow of 0.5 L/min at 900 °C for 1 h with a heating rate of 5 °C/min. The obtained ET-derived pitch based ACFs were marked as ETP-ACF, ETP-200-ACF, ETP-250-ACF, ETP-300-ACF, respectively. The SP and rheological properties of pitch precursors was determined by a capillary rheometer (CFT-100EX, Shimadzu). The chemical compositions and structures of pitch precursors were determined using an elemental analyzer (Vario ELIII, Elementar), a fourier transform infrared spectrometer (FITR, Nicolet iS10, Thermo Fisher Scientific), and X-ray diffraction (XRD, D2500X, Rigaku) with CuKα2 radiation, respectively. Besides the oxygen content was calculate by the subtracting method (O = 100-C–H–N–S). The thermogravimetric (TG) properties of pitch precursors were measured using a thermal analyzer (STA 449, Netzsch). The morphology of the prepared CFs and ACFs were observed by scanning electron microscopy (SEM, JSM-6700F, Joel) under the acceleration voltage of 20 kV. The porous textures of the obtained ACFs were characterized by N2 adsorption isotherms at 77 K with a specific surface area analyzer (TriStar II 3020, Micromeritics). Brunauer–Emmett–Teller (BET) equation was used to calculate the BET specific surface area (SBET), and the t-plot method was applied to evaluate the micropore volumes (Vmic), and the total pore volume (Vt) was evaluated at a relative pressure of 0.99. The pore size distribution of ACFs was analyzed by density functional theory. Meanwhile, the concentrations of oxygen functional groups for each ACF were measured by Boehm titration . During the Boehm titration analysis, weighed amounts of ACFs (0.2 ± 0.0001 g) were mixed with a volume of 50 mL 0.1 M NaHCO3, 0.05 M Na2CO3, and 0.1 M NaOH in a 150 mL flask. The base solutions without adding ACFs were used as blank runs. The flasks were sealed and then shaken for 24 h with 150 rpm at 25 °C. Afterward, the suspensions were filtrated with qualitative filter paper. 10 mL of filtrate for each flask was mixed with 20 mL 0.1 M HCl, and 0.1 M NaOH was used to back titrate the solution while stirring. The number of acidic functional groups was determined and calculated under the assumption that NaHCO3 neutralizes carboxylic groups; Na2CO3 neutralizes both carboxylic groups and lactonic group; and NaOH neutralizes phenolic hydroxyl groups, as well as lactonic groups and carboxylic groups. The SP, yield and elemental analysis results of the four pitch precursors are listed in Table 1. The SP of four pitches was around 200 °C after distilled treatment. Compared to ETP, oxidized pitch had higher yield and the yield increased gradually as increasing the temperature of air-blowing. It suggested that air-blowing could increase the yield of pitch due to the introduced oxygen. The oxygen content of oxidized pitch had an evident uptake comparing to that of ETP as shown in Table 1. Moreover, the oxygen content increased continuously with the increase of air-blowing temperature, as ETP-200 was 4.45%, ETP-250 was 5.34% and ETP-300 was up to 6.01%, respectively. These showed that the air-blowing method can effectively increase the oxygen content of pitch precursors, and the oxygen content of pitch precursors could be controlled by altering the air-blowing temperature. The main mechanism during the air-blowing process could be the oxidation of both Ar–Ar structure (biphenyl structure) generated by the decomposition of naphthenic structures and the alkyl side chains which leads to the formation of oxygen groups . Therefore, it can be inferred that some oxygen functional groups (hydroxyl, carbonyl, carboxyl) could form during the controlled oxidative treatment. The viscosity-temperature curves of the four pitch precursors are shown in Fig. 1a. All pitch precursors showed great rheological properties, which was in favor of the spinnability of pitch. Figure 1b shows the TG curves of the four pitch precursors. Oxidized pitch generally had more weight loss than that of ETP, which illustrated that the introduced oxygen in oxidized pitch promoted the oxidative decomposition of pitch during heat treatment. The FT-IR spectra of four pitch precursors are shown in Fig. 1c. The wide and sharp absorption peak in 3300 cm−1 to 3600 cm−1 was attributed to O–H stretching vibration, and the strong absorption peak at 2920 cm−1 was assigned to the –CH2– stretching vibration, respectively . The sharp peaks at 1600 cm−1 indicated the existence of C=C skeletal vibration. It should be noted that a new stretching vibration peak around 1700 cm−1 started to appear with the increase of air-blowing temperature (from ETP to ETP-300), which was attributed to carbonyl C=O. After air-blowing, the absorption peak intensity in 3300 cm−1 to 3600 cm−1 and 1650 cm−1 to 1750 cm−1 strengthened, suggesting that the content of oxygen functional groups, mainly hydroxyl (–OH) and carboxyl (–COOH), had a certain amount of increase. This was consistent with the results of elemental analysis. The increase of oxygen functional groups might indicate that oxygen served as bridged bond between of pitch molecules due to intermolecular cross-linking reaction during the air-blowing process. In order to further investigate the structure and molecular order of oxidized pitches, XRD of four pitch precursors was performed and shown in Fig. 1d. All of them showed a broad peak between 10° and 30°, which could be attributed to the amorphous carbon structure. As shown in Fig. 1d, ETP had another diffraction peak between 20° and 30°. The peak was attributable to stacked graphite crystallite structure . It proved that the presence of oxygen could hinder the order stack of molecules so that pitch without oxidation treatment had a more evidence stacked structure. Table 2 shows the yield and oxygen content of four pitch fibers during the stabilization, carbonization and activation processes. Compared with ETP-Fiber, oxidized pitch-derived fiber had lower stabilization yield. Moreover, the stabilization yield and oxygen content of oxidized pitch-derived fiber slightly decreased with the increase of air-blowing temperature, which indicated that the introduced oxygen in pitch precursors reduced the degree of oxidative of pitch fibers, showing less oxygen uptake of fibers after stabilization. This conclusion could be inferred from the fact that more oxygen existed in the pitch precursors inhibited oxygen diffusing to the fiber during the stabilization process. It should be noted that stabilized fibers of oxidized pitches had higher carbonization yield than ETP-Fiber. Moreover, the oxygen content of CFs (it was 5.82% for ETP-200-CF, 6.03% for ETP-250-CF, 7.12% for ETP-300-CF) were higher than that of ETP-CF (4.62%) on the contrary, which suggested that less oxygen was released from the oxidized pitch-derived fibers during the carbonization process. The change of oxygen content indicated that the introduced oxygen in pitch precursors was more stable than the oxygen added during the stabilization process and oxidized pitch-derived stabilized fibers could remain more oxygen after carbonization at 800 °C. Thus, there would be more active sites in oxidized pitch-derived CFs during the activation process. As a result, the activation yield decreased with the increase of the oxygen content of CFs, as ETP-200-CF was 68.06%, ETP-250-CF was 66.89%, and ETP-300-CF was 64.86%, compared to 73.61% for ETP-CF, indicating that oxygen can promote the activation of CFs. Overall, the introduced oxygen in pitch precursors could impact the stabilization, carbonization and activation processes of the oxidized pitch-derived fibers, promising to prepare ACF with different porous texture and surface chemical properties. SEM images of ETP-250-CF and ETP-250-ACF are shown in Fig. 2a, b. In Fig. 2a, ETP-250-CF had a smooth surface and no fusing phenomenon, which indicated that the stabilization conditions were appropriate. Comparing Fig. 2a, b, it could be seen that a special porous texture was formed during activation process due to the oxygen existed in CF. As shown in Fig. 2b, some hollow structure could be observed inside of ETP-250-ACF. The special hierarchical pore texture is expected to have a good application prospect in the field of catalytic adsorption of ACF. Figure 2c presents the N2 adsorption isotherms obtained at 77 K for the prepared ACFs, and the pore textures of obtained ACFs are listed in Table 3. All the isotherms are type I following the IUPAC classification , indicative of the microporous character of the prepared ACFs. Clearly, ACFs prepared from oxidized pitch precursors had a higher saturation adsorption capacity. Among them, ETP-250-ACF had the highest saturation adsorption as well as the highest SBET, Vt and Vmic, which was 1047 m2/g, 0.46 cm3/g, and 0.43 cm3/g, respectively. It was worth mentioning that ETP-300-ACF had lower adsorption capacity compared with ETP-200-ACF. 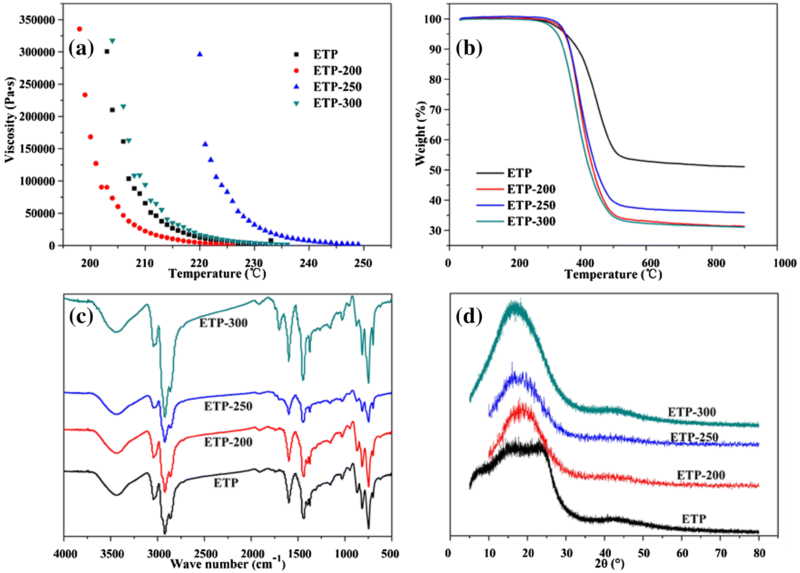 Moreover, the SBET, Vt and Vmic of ETP-300-ACF was all lower than that of ETP-200-CF, which might be due to the high oxygen content caused by excessive oxidative treatment. This assumption could be further confirmed in Fig. 2b showing pore size distribution of the ACFs. The pore size distribution of all four ACFs was narrow, and almost all of them were concentrated in the micropore size range of 0.85–1.0 nm. 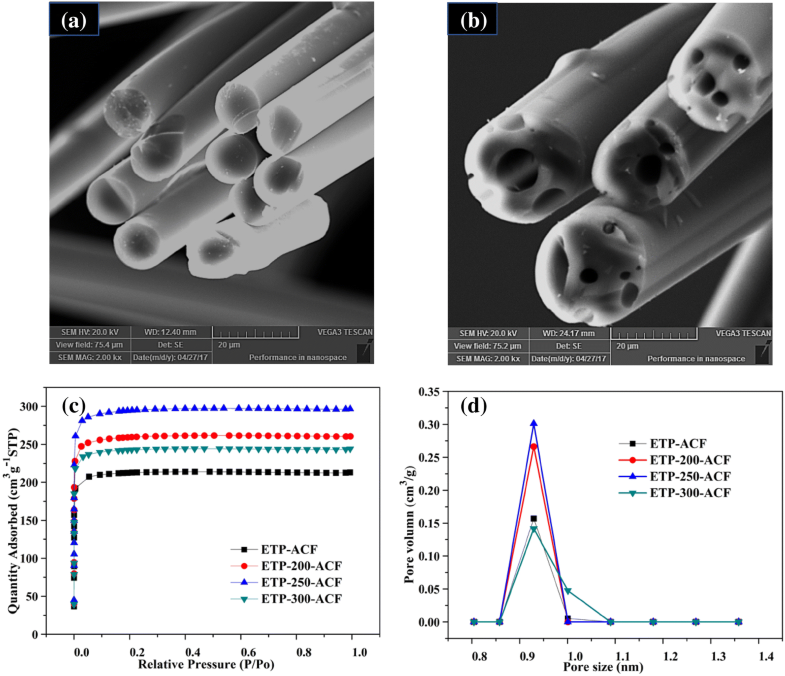 The pore size distribution of ETP-300-ACF was somewhat expanded with a small amount of pores size distributed in 1.0–1.1 nm, which indicated that the pore structure of ACFs prepared from the pitch precursor with high oxygen content was easy to enlarge. The oxygen functional groups of ACFs from the Boehm titration results are listed in Table 3. As shown in Table 3, ACFs prepared from oxidized pitch precursors generally had more oxygen functional groups. Among them, ETP-250-ACF had 0.536 mmol/g carboxylic group, 0.043 mmol/g lactonic group and 0.193 mmol/g phenolic hydroxyl group on the surface compared with 0.330 mmol/g carboxylic group, 0.024 mmol/g lactonic group and 0.153 mmol/g phenolic hydroxyl group for ETP-ACF. It proved that the introduced oxygen in pitch precursors increased the oxygen functional groups of ACFs. Three kinds of pitch precursors with different oxygen contents were prepared using ET as a raw material by air-blowing method. Compared with untreated pitch, oxidized pitch had higher oxygen content, and the introduced oxygen in pitch precursor was more stable than the oxygen added from stabilization process. Moreover, the oxygen existed in CFs prepared from oxidized pitch precursor could promoted the activation effect of CFs. Thus, ACF prepared from oxidized pitch precursor had more developed porous texture and richer oxygen functional groups and special pore structure. The introduction of oxygen into pitch precursor would be a good method to improve the porous structure and surface chemistry of ACF. The authors appreciate the support of Wuhan Luhua Yueda Chemical Co. Ltd, China for providing ethylene tar. JXY conceived and designed the experiments; HPW, JL and KS performed the experiments; HPW, JL and JXY analyzed the data; JXY and XKL reagents/materials/analysis tools; HPW and JXY wrote the paper. This research was funded by the National Science Foundation for Young Scientists of China [Grant Number 51702094] and the Natural Science Foundation for Young Scientists of Hunan Province, China [Grant Number 2017JJ3014].